Startpage.com announced today that Phil Zimmerman, the creator of Pretty Good Privacy (PGP) joined the company "to spearhead its product innovation and crypto-development". Startpage.com, which is best known for its privacy focused search engine and email service, is known for its firm stance on privacy on the Internet. The company's Internet search engine can be best described as a privacy-friendly version of Google Search with some nice to have features added to it like a proxy service to access any site through the proxy to protect IP addresses of Startpage users. Startpage.com CEO Robert Beens revealed that Zimmermann will advise the company on its search product but that Zimmermann's main focus will be the "development of the company's next-generation PGP-encrypted email service". 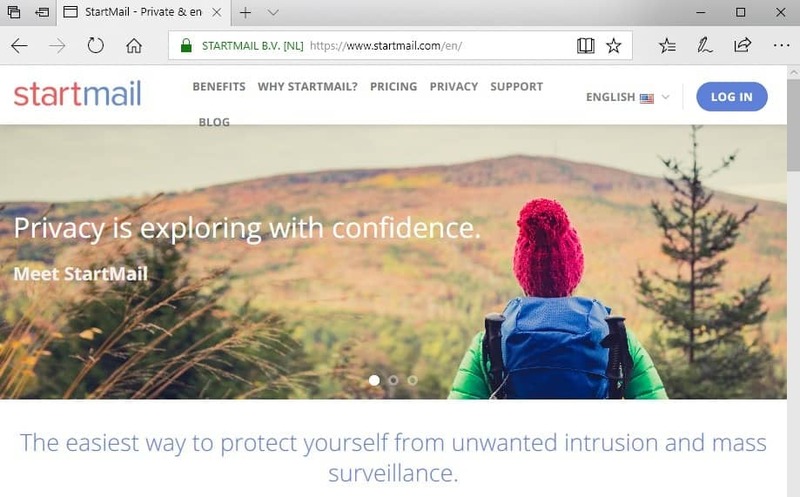 Startmail is the company's privacy-focused email service. It is a paid service that anyone may try for free. Paid accounts are available for $59.95 per year and that gets users integrated PGP email encryption support, 10 Gigabyte of space, IMAP support, and unlimited disposable aliases to use. Zimmermann will work on the next version of Startmail and his main focus will be on the cryptographic basis of the service. The following quote was attributed to Zimmermann in the press release. It appears from that description that integration of PGP in Startmail will be the main focus of Zimmerman at Startpage. Startpage did not reveal additional information at this point in time. It is probably too early to reveal any considering that Zimmermann joined the company only today. It seems likely that the hiring of Zimmermann will improve Startpage's standing with privacy and cryptographic groups and community further. We will keep you updated on any products, changes or announcements that come out of this. Now You: What is your take on Zimmermann joining Startpage? Being from Europe,and not wanting usgov to snoop around my searches and email, I highly appreciate Startpage and Startmail. But although Startpage (supposedly) only filters googel results, not all googel result pass the filter somehow. The outcome of an identical query results in a different outcome from each search engine, unfortunately. not being from europe, I want the same thing. If you want a search engine that doesn’t customize, you probably need a search engine that isn’t cliffing off Google’s results. :) Not that there’s anything wrong with that. I’m just saying that Google doesn’t do static results that are the same from person to person anymore, so any service that uses Google results will have that limitation (or feature) unless it has a contract with Google stipilating otherwise, and I don’t think startpage has a contract with Google. Anyone know if DuckDuckGo is its animal that independent crawls the web and serves results? Or is that also getting results from other search engined and adding its own special sauce? How many truly independent search engines are left that get all their results from their own bots? I know that Yahoo and AOL are getting them from Bing (with special sauce added). Startpage is Google. So we’ve got Google and Bing. Maybe DuckDuckGo? What about that search engine that plants trees? What’s its deal? @John: DDG leverages Bing results of I remember correctly, and so do Ecosia (the tree planter!) and Qwant. Basically, any search engine not siphoning off Google is going to be using Bing instead as the only major alternative. I presume there’s some sort of custom agreement with Microsoft. Ecosia is the name of the search engine you are thinking of. I vaguely remember duckduckgo having some sort of link between yahoo. I remember seeing something about yandex too if that means anything. Duckduckgo have their own crawler, and they also source their results from Bing, Yahoo, and Yandex. Yep. I’m sure it’s not coincidental that when they started “customizing” search results is when the quality of search results I was getting from Google started seriously declining. For better or worse, I no longer get better results from Google than I get from DuckDuckGo — so I use DDG almost exclusively now! wondering whether you have checked, and rules out, the possibility that any differences you are seeing are due to comparing results from google.fr (or other localized google server) vs startpage spoofing USA geolocation in all proxied queries. My gripe about StartPage is that it is 100% based on Google Search, which means one is still dependent on Google’s filtering of what it considers the ‘right’ info and what is not. This is particularly pertinent to political subjects. So, yes, your search is private, but the quality of the search results is biased, to say the least. Even DuckDuckGo is now using some form of that kind of filtering. So, for now I use Qwant as my day-to-day go-to privacy-based search service, and Yandex if I need to research some politically sensitive subject, although A Russian political subject wil probably also be biased. Respectfully, I would suggest that if the Russian government is at all involved in a Russian search engine, then its political bias probably extends far beyond subjects having directly to do with Russian politics, given that Putin has been systematically interfering in elections across Europe and the United States in recent years. Mostly, Putin’s money and efforts go toward backing far-right nationalist parties, although it’ll back the occasional left-wing group as well if it thinks doing so will destablize and weaken Russia’s strategic rivals on the world stage. This is why you get situations like an Italian coalition that is isolationist and xenophobic, is anti-immigration, and speaks of withdrawing from the EU and the Euro, but then bizzarely has a platform plank urging that the the EU lift all sanctions against Russia. I say bizzarely not because its necessarily an absurd policy to pursue dente in the abstract (Although I do not say that I favor it either), but because it seems in apparent contradiction to their desire to isolate themselves from everyone else. I think its reasonable to suspect that perhaps money or some other source of support is coming to that movement in Italy from Russia- that there are reasons why these Italian politicians make this one exception for one country it wishes to engage with and not others. The point I am trying to make is simply that in Russia there is no free press any longer, and Russia has clear stances about domestic politics in other countries. So, I would expect *at least* as much political bias from a Russian search engine as from an American one, even when it comes to American politics. I’ve tried to specifically avoid making ideological points here, I’m just purely trying to convey that there is likely to be a bias to the Yandex- perhaps a bias some might like or not mind, but certainly a bias. Respectfully, I would suggest to keep your political comments to yourself when on this forum as Ghacks is NOT a political forum. Nevertheless, not wanting to disappoint you after you went to town on composing such an extensive comment, I will write a brief reply. 1. Whatever search engine I choose is my choice and my choice only, to put it politely. 2. None, and I mean NONE, of the Western allegations of Russian interference in political processes have been backed up by concrete, fact-based evidence, just like the Skripal case, all the chemical attacks in Syria, and not even the MH17 case, have been backed up by evidence. So I respectfully suggest that you leave my news channel choices to me, and that you broaden you information horizon beyond the standard government propaganda that you then regurgitate like a loyal parrot. Klaas, I will go even further than what you’ve said: I have seen with_my_own_eyes how much whitewashing (and in some cases outright lying) of the news is done by the big English-language Western news services. The propaganda is not limited to Russian media. I am fortunate to be able to read Greek and Italian media, so I readily see what stories are not being covered (or are being buried as much as possible) by the major English-language media. I think a lot of people don’t realize the extent of the bias either because (a) they are entirely reliant on one language, or – the really sinister possibility – (b) they happen to share the ideology of the people in power, so they don’t feel the need to question what like-minded news editors and publishers are telling them. This latter point is huge, but you only realize how big it is when you find yourself outside of the establishment. @Jason: thanks for jumping in Jason, and you are spot on. Pity there are still so many people who believe the standard government BS, and regurgitate it. This is dead wrong, as are your claims about Skripal, Syria, etc. But you have clearly opened wide and sucked deeply the Putin-propaganda and now regurgitate it here like the loyal Putin-parrot you are–you are beyond hope–so this reply is NOT for you but for everyone else who visits here and happens upon your BALD-FACED LIES. Stating that there is bias in Yandex info is merely a restatement of what I already acknowledged in my original comment, albeit with the qualifier “probably”. Ziimerman–High ranking officer of the cryptographic community who would add unbelievable value to StartPage both in terms of monetary gain and user base. What to say, though. An article on the many PGP add-ons for Gmail could help spearhead a a movement for users to start using cryptography even at home and at work. Paying for PGP isn’t necessarily needed anymore. I thought “crypto-development” might have had something to do with bitcoin. Kind of scared me as that might eventually lead to Startpage mining coins from their user base. I avoid anything “blockchain” or “bitcoin” related, usually bad news for end users. Sigh… Crypto doesn’t mean cryptocurrency, it is originally shorthand for cryptography. It’s kinda annoying when people assume it relates to bitcoin and such. Zimmermann is in German term’s a carpenter, also Bob Zimmerman (Aka Bob Dylan) has lines who hammering into your souls like nails. Also, I know a designer named Zimmermann. With his 64 years, Phil Zimmerman has a lot of experience so I am looking out for his influence with great anticipation. Years ago I noticed this privacy issue with Startpage.com.. When you search for something, the page displays the results, often with sample content from each page. This is much like Google and the like, EXPECT if you try to select any of that text in the Startpage results, it will automatically take you to that site, just as if you clicked on the main link, but you didn’t! This is NOT a normal website function! Users should not be forced to a site like this! For example, there are many times when we find what we need right there in the search results, where we just want to copy some of the text there. But not with Startpage, as the whole result is an over-sensitive link, that gets triggered by just selecting any of the text there. Not good if you didn’t want to visit the CIA homepage, ha. Oops, too late! Furthermore, I explained this issue in detail to Startpage but the person who got back to me was clueless, asking me to send a screen capture of this so-called curious issue I’m having. Ha, forget that. This is such an obvious security issue that Startpage should never have implemented it in the first place! That said, Startpage never fixed this issue. No surprise there, ha. I now use DuckDuckGo, Qwant and Qwant Lite, and the results are better IMO. I think the results from Startpage have always been limited, and far less than what Google provides. Tip: You can use an extension like Popup Blocker (strict) to stop Startpage from going to other pages like that. But why? Well, perhaps Startpage will get better with Zimmermann.. Hmm. If you want to copy the url link without clicking into the website, start copying the link just above or before the start of the link. You can also copy the link and whole description that way by starting just above or before the link. You can also right click and copy the link location to capture the link without clicking to the site. That is clearly not true. Are you a corporate robot? This is a tactic only common on sketchy sites. Regardless if the text is plain or linked, the mouse action of ‘left>select’ should not do the same as ‘left>click’. Yet Startpage treats those the same. Not cool. Bing, Google, Qwant, and DuckDuckGo do not do this. With them you can select on any of that text without triggering that action, where there is zero requirement to use that “trick” you suggested. Also note, some of those so-called search results on Startpage are ads (Ads by Google). Besides them being ads, they are normal, where they don’t take you to the link unless you actually left>click the link as normal. I guess Startpage isn’t allowed to screw with those, ha. That said, until they fix this issue, I won’t consider trusting Startpage again. Hi Ray. I looked into your concern again because we were having different experiences. On mobile devices, the “clickable link” area is usually larger and extends beyond the underlined link because a big problem is the small type size. Maybe that explains the differences. I’ve contacted startpage as well with exactly the same complaint a couple of years ago but nothing has change like you said. $60 for an average privacy email provider is too much, there are cheaper alternatives.